Download SSC CHSL admit card for the examination of LDC and DEO 1997 posts in SSC 2014. Staff Selection Commission Invited all India vacant posts of SSC LDC and SSC DEO recruitment notification for the current year 2014. The last date of applying for the SSC CHSL was 19 August 2014. 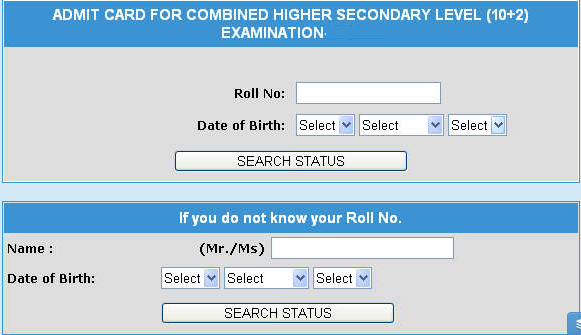 Now as per scenario applicants should looking for the Syllabus and admit card SSC LDC or SSC DEO Hall ticket. As per the notification the examination date of SSC LDC and DEO exam is 02.11.201 and 09.11.2014. The admit card can be download from the 25th October 2014. Click that following link and enter your Registration ID and password. And some others: Bhubaneshwar(4604), Cuttack (4605), Ranchi(4205), Chinsurah ( 4405 ), Siliguri (4415) Berhampore(4403), Malda(4412) Keonjhargarh (4606), Bardhaman ( 4404 ), Thiruvananthapuram (9211), Kochi(9204), Thrissur(9212), Gulbarga(9005), Mangalore(9008), Dharwar(9004),Kozhikode (Calicut) (9206), Jaipur(2405), Jodhpur(2406), Bharatpur (2403) Kota(2407),Bikaner(2404), Udaipur(2409), Ajmer(2401), Alwar(2402), Sriganganagar(2408), Haldwani(2003), Guwahati (Dispur)(5105),Itanagar(5001), Dibrugarh(5102), Jorhat(5107),Silchar(5111), Imphal(5501), Shillong(5401), Aizwal(5701), Kohima(5302), Churachandpur( 5502 ), Agartala(5601)Tura (5402), Goalpara(5104 ), Tezpur ( 5112), Lakhimpur ( 5109 ), Guntur(8001), Kurnool(8003), Rajahmundry(8004),Tirupati(8006), Coimbatore (8202), Chennai(8201),Madurai(8204),Puducherry, (8401), Tirunelveli(8207), Tiruchirapalli(8206), Vishakhapatnam (8007), Aurangabad(7202), Kolhapur (7203), Nagpur(7205), Panaji(7801), Pune(7208), Ahmedabad(7001), Vadodara(7002),Rajkot (7006), Nashik (7207),Amravati (7201),Surat (7007)Ambikapur(6201), Indore(6006), Jabalpur(6007), Jagdalpur(6203), Chindwara(6003), Guna(6004), Bilaspur(6202)Chattarpur(6002), Mandsaur(6010), Jhabua(6008), Khandwa(6009), Rewa(6012), Raipur(6204), Bhopal(6001), Gwalior(6005), Jalandhar(1402), Leh(1005), Chandigarh(1601), Jammu(1004), Bhathinda (1401),Hamirpur (1202), Anantnag (1001), Baramula(1002), Rajouri(1006)Kargil (1008), Dodda (1009),Amritsar( 1404) Patiala (1403).